With its “worker-user integration”, Haier utilizes the IoT to provide a simplified interaction with users. The company recently presented at the MCE trade fair a light-absorbing and air-purifying AC, an air-zoning AC, an easy installation F-series self-cleaning AC, and other new products. Haier also displayed the magnetic levitation central air conditioning system, which reduces energy consumption by 50% and will be launched in Europe, where 85% of the cities have not met EU quality standards and are in critical need of improving indoor air quality. Haier customized the F-series ACs for the European market. These units are easy to install and self-cleanable. Using a modularized and easy-to-install model, they save up to 50% of installation time and 80% of service time. They are also able to give out clean air, eliminating secondary indoor pollution. 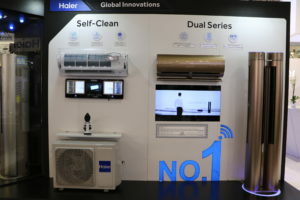 “Haier – said the company in a official note – is the world’s No.1 connected air-conditioning (including smart air-conditioning) brand recognized by Euromonitor International”.